Good morning all, I hope everyone’s well and out enjoying this somewhat exceptional summer we’re having ? We’re less than 2 weeks away from the race, so this is my third instalment of info in the run up to the event. I’m still getting lots of questions from people that have not downloaded and read the race info pack yet, so if you’re one of those, please head to https://www.113events.com/cotswold-classic/downloads/ and download it as it contains important info about the race. I’m still reasonably confident that we won’t have to ban wetsuits on race day, as yesterday was 30deg air temp, and the forecast is for it to reduce somewhat next week, which should help bring the water temperature down, along with a little cloud cover. Generally, we can find a cooler spot in the lake and we do get some adjustment for air temperature. However, if the water does go back up to the 27.8 deg it was at the end of last week, it’s just not safe to swim the distance in a wetsuit. I got in the lake in my wetsuit last week (water temp 26.9) and swam the full 1.9km course just to see just how bad it’d be swimming that far in a wetsuit, and I absolutely cooked myself. Although I felt fine initially getting out the water, the heat exhaustion meant for the next few minutes I was pretty wobbly, and this is a critical time when you’re racing as you’re setting out on the bike on a hard tarmac surface. We will keep everyone updated early next week, and I’m still reasonably confident that the temperature will drop to within the ‘Wetsuit optional’ range, but I just wanted to keep transparency of our process so we don’t get anyone worrying perhaps unnecessarily. Even if it does go into the Wetsuit optional range, I’d strongly suggest that people have a go at open water Swimming without a wetsuit in the run up to the race, as it’s a much nicer experience when the temperatures are high. We have our registration for the race on Saturday the 4th between 13:00 and 17:00 at the lake, right next to the swim start and the race finish. At registration, you will collect your race pack, which includes your timing chip, a bike sticker, your race number and your swim cap, the colour of which relates to your swim wave. You will also get your shirt and your goody bag. This year, to reduce plastic bag use, your goody bag won’t actually come in a plastic bag, but you’ll get the goody itself and the shirt in your hand as we use around 1000 plastic bags that then just get binned as soon as you get back to your car. To register, you will need photo ID and £5 cash for a BTF day license, or if you’re already a BTF member, you’ll need your 2018 BTF license card. You can get someone else to register for you, and they’ll need a photocopy of your photo ID or BTF membership, and £5 cash if you’re not a BTF member. It has to be a photocopy, and needs a note on it from you saying it’s fine for ‘Joe Bloggs’ to collect on your behalf and your signature. To comply with the BTF rules, we have to retain these photocopies and pass them to the BTF ref so he can make spot checks in transition that the person racing is the person that should be racing. We can’t, unfortunately, post out race packs as the postal system uses magnets, and these play havoc with the timing chips. We will also have the race packs ready at our house by around Wednesday PM next week, so if you’re passing Swindon on the M4 at the end of next week, and want to come and collect your pack from Nicci (I’ll be at the lake all next week getting things ready), you’re more than welcome, and we might even have some biscuits in the tin. Briefings – Everyone that races will have a quick 3 minute compulsory briefing 10mins before your race wave start. This will cover all the important safety aspects of the race. However, on Saturday the 4th, we will hold full briefings next to the swim exit / transition that will go through the entire race bit by bit. These are not compulsory, but they’re a great way to hear how the race works and we’ll literally talk you through everything that will happen on race day and answer any questions you might have. We will hold all our parking in the field around 250meters from the Beach end entrance to the lake on Saturday and Sunday. This field is owned by a local farmer, who has charged us a small fortune to use it, so as such, there will be a parking charge for both days to cover the cost of the field and the people to control it both days. In fairness to the farmer, he does donate a good chunk of his fee to Wiltshire Air Ambulance. The parking charge is £2 for the Saturday and £5 for the Sunday payable in cash. It’s a field, and although it’s pretty flat for a rough grass field, if you were planning on coming in your Ferrari , I’d suggest you perhaps look at something will a little more ground clearance. Any normal car should be perfectly fine. The field has enough space for all competitors and a small amount of spectators, but please can I ask that you park nice and close to the car next to you as we can very easily reduce it’s capacity by 30-40% if people park all over the place or leave 8 foot between the car next to them. If you have spectators coming along later on Sunday, you’d do well to advise them to come earlier rather than later as once that car park is full, the only other real option is to park in the beach and country park, and they will charge you something like £14 per car, and they also fill up veer quickly if the weather is looking good. 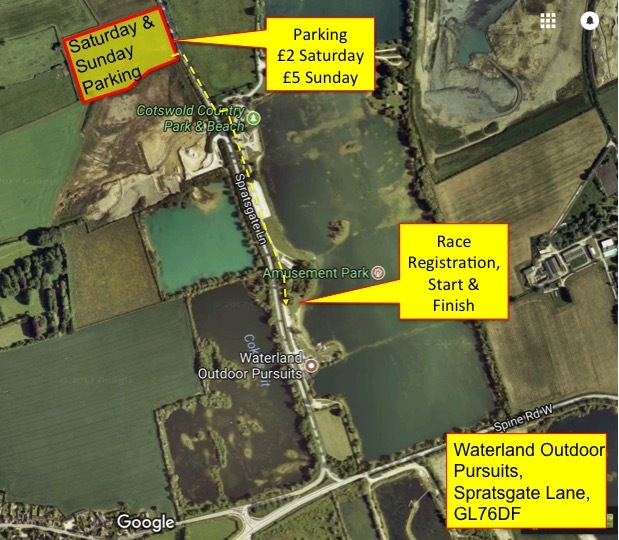 The car park only has only one entrance, so just to reiterate, please leave yourself a good amount of queuing time Sunday morning and have the right change to hand when you get to the payment marshal. Given it’s been so warm, we’re going to put an extra water station out on the run course around 1 mile after transition. We will need another 6 or 7 people to man this. We can also use a few more people on the bike course, so if you have anyone coming along that fancies getting involved, please get them to email me at graeme@113events.com.